What is the material viscosity? Is it a single part or two part? Does the viscosity change from batch to batch or does it get thicker over time? The technical data sheet from the formulator should be able to tell you the thickness of your material. What is the individual shot size, per part, in volume? How accurate and repeatable does the shot size need to be? This helps us decide if a standard syringe dispenser will work, or if you need a more accurate positive displacement valve - or even an automated solution. What is the total volume you will use in a day or in a shift? Will it be CCs, or Ounces or Gallons? 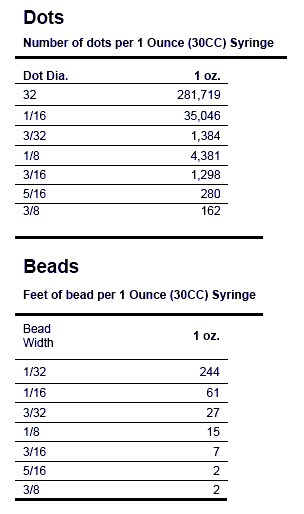 This helps us again determine the correct reservoir size for your dispenser to draw material from. 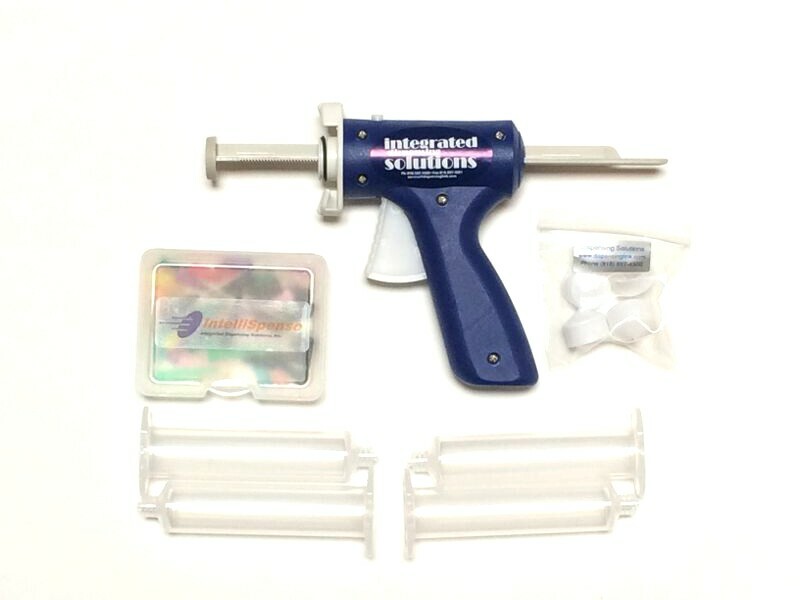 8880370 IntelliSpense™ 30CC Plastic Manual Syringe Gun, Complete with DSK30CCSNK Basic starter kit* including 4 syringes and sample needles for 30 CC dispensers and manual syringe guns. This gun is intended for use with IDS pneumatic syringes only - reorder 8880322 30cc Clear Pneumatic Syringe/Piston Pack. Free Shipping to anywhere in the Continental USA UPS Ground. Availability: Can range from in stock to 4 week build time. Dual Gauge Analog/Digital Dispenser, complete with starter accessory dispensing kit: 30cc/ml syringes, adapter head that fits 30CC and 55CC Pneumatic syringes, foot pedal trigger, and selection of needles, tips and stand, as well as a Finger Switch, that simply wraps around the syringe with a secure Velcro belt, giving finger tip control. SHIPPING COST INCLUDED IN PRICE - UPS Ground anywhere in the Continental US. Availability: in stock to 4 week build time. ​The 7020000-2LPKG includes the 7020000 manual diaphragm valve, material line, the 7011010-2L - 2 liter open top reservoir, and a desktop stand to hold the valve when not in use. Requires clean compressed air up to 100psi. This system is intended for manual user control only, for dispensing low to medium viscosity flow-able material. Flux, Cyanoacrylates, Paints and more. The 5101292-2LPKG includes the 5101292 Front Closing Valve the 7011010-2L - 2 liter open top reservoir, the 5900011VC valve controller and a desktop stand to hold the valve over the work area. Requires clean compressed air up to 100psi. 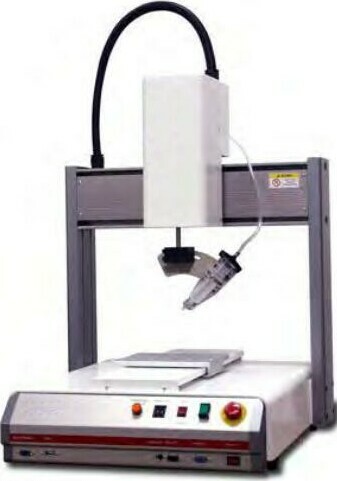 This system is intended for timed metered shots or manual user control, used in automation or at the desktop level for potting and encapsulation for electronics and medical device, Filling molds, timed dispensed shots filling vials or other receptacles, epoxy dispensing, flux, dam and fill, Paints and more. These valves are steel and are not suggested for use with CA (Cyanoacrylate) material. SHIPPING COST INCLUDED IN PRICE - anywhere in the Continental USA that can receive UPS Ground shipments. 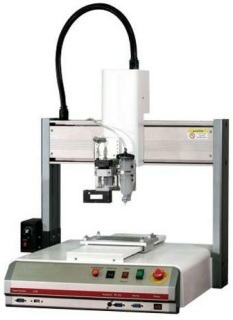 The DPAV-200DAK-PKG is a benchtop or automation capable auger dispensing valve and the 7070000 Servo Valve controller that can connect to a robot with an IO cable or used manually with a foot pedal trigger. This unit is a stand-mounted DPAV-200 Servo Driven Auger Valve fed by a 55cc pneumatic syringe and includes a sample kit of various needle sizes. It is provided with the 8 gauge pitch unless otherwise requested. Larger reservoirs are available to upgrade. Contact an IDS representative for a quote. 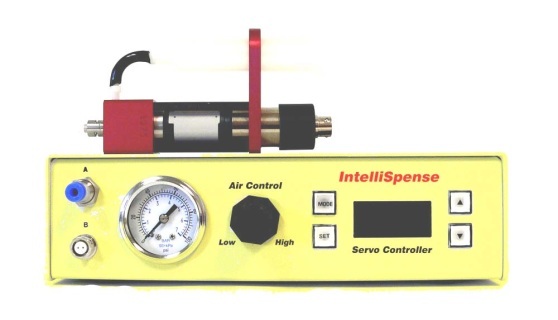 Requires regulated compressed air lines up to 100PSI for each unit to function. 115V or 230V power supply. Intended for high accuracy small dot or line deposits, even if the material thickens over time or changes in thickness from batch to batch. 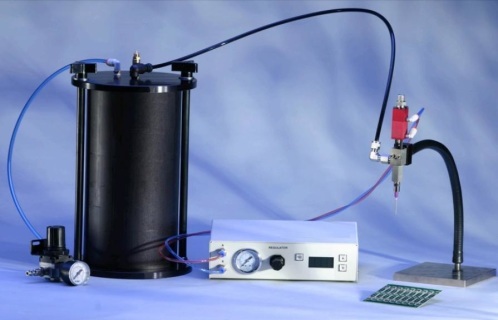 Perfect for Solder Paste, flux, and other filled materials. Includes the 5552201N 200MM Economy Robot, pneumatic syringe controller that works with 30cc or 55cc pneumatic syringes, the teach pendant, IO cable, Syringe mount. Requires 1 regulated compressed air line, up to 100psi, each to function. 115V or 230V power supply. Intended for entry level dispensing. If this is a new application, or you have never used a system like this before we suggest contacting IDS directly to discuss your options. Includes the 5551104, 4 Axis Robot fitted with a pneumatic syringe controller that works with 30cc or 55cc pneumatic syringes, the teach pendant, IO cable, and Syringe mount. Requires 1 regulated compressed air line, up to 100psi, to function. 115V or 230V power supply. Intended for complex level dispensing. Perfect for flat screen manufacturing, gasketing, sealing enclosures or any application where the head needs to rotate to stay perpendicular to the part or stay aimed and dispense into the corners rather than alongside the wall of the part. Includes the 5551107N 5 Axis Robot fitted with a pneumatic syringe controller that works with 30cc or 55cc pneumatic syringes, the teach pendant, IO cable, and Syringe mount. Requires 1 regulated compressed air line, up to 100psi, to function. 115V or 230V power supply. Intended for complex level dispensing. perfect for flat screen manufacturing, gasketing, sealing enclosures or any application where the head needs to rotate to stay perpendicular to the part or stay aimed and dispense into the corners rather than alongside the wall of the part. 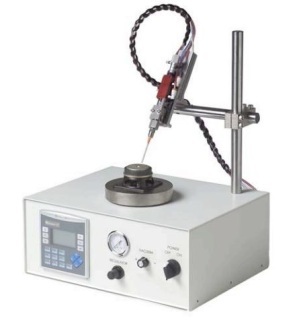 Are you wondering how to dispense glue, adheasives, epoxies, solder paste, RTV, grease, silicone or other assembly fluids? The right dispenser will depend on the material viscosity, the individual shot size, the total volume dispensed in a day or shift, and the accuracy you are trying to achieve. We can help you in a variety of ways. Over the past 20 years, dispensing technology has evolved from benchtop and foot-pedal-controlled equipment, to semi- and fully automated high-performance valves and dispensing robots. Manufacturers have embraced automation for several reasons. Automated dispensers are cost-effective and easy to implement. They also increase production, improve quality and reliability, reduce worker fatigue, and provide a cleaner, safer working environment. 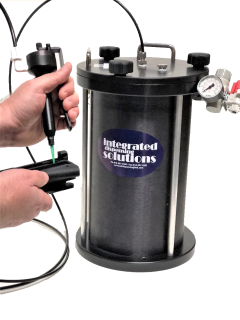 A semiautomatic dispensing system maintains consistent shot size by allowing the user to enter trigger points for pressure, time and vacuum settings. Assemblers only need to program the controller once for each fluid and job. 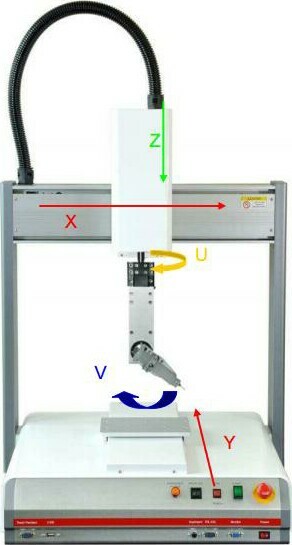 The system displays dispensing parameters to simplify control. Consistent shot size lowers material cost by reducing fluid waste and overall fluid consumption. This can be critical, as some materials, such as silver-filled epoxies, cost several hundred dollars per ounce. Systems that can reliably dispense these expensive materials are critical to a manufacturer’s profitability. Automated dispensers prevent dispensing in the wrong location, eliminating part cleaning or rework — both of which lessen productivity, increase cost, and increase the chances of part failure. Dispensing technology continues to evolve, but there will never be a one-type-fits-all solution for all types of manufacturers. One company with extensive dispensing equipment experience may require systems with the utmost speed and precision. 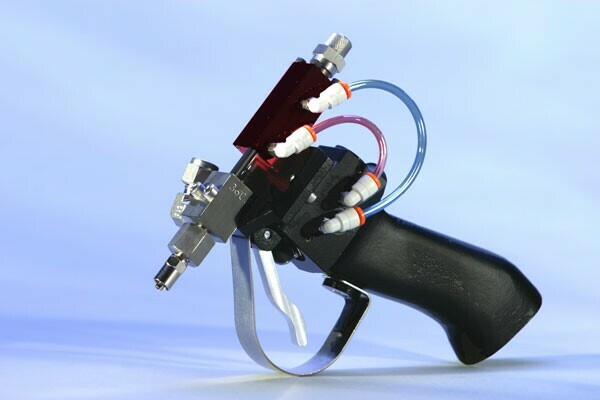 But another company that is just starting to automate their dispensing process may be better served with simpler handheld or benchtop equipment. We are here to help choose the one you need for your exact application. First find the adhesive or other material you are going to be dispensing from a reputable formulator, to make sure your dispensing is not needlessly expensive, with equipment changes necessary. When using a pneumatic dispenser (air driven) you can change dot size by applying different air pressure, time settings and tip sizes. 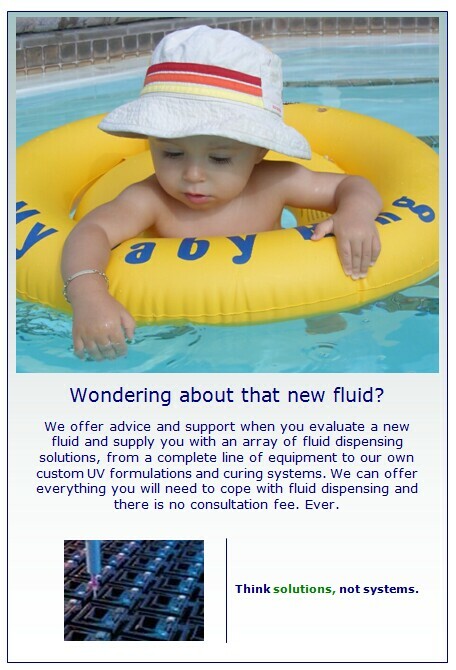 We will be glad to help you choose the right size or supply you with a variety of choices. Increasing either the air pressure, time duration or tip size will increase the dot size, while decreasing either the air pressure, time duration or tip size will decrease the dot size, even with positive displacement systems. Thicker, more viscous liquids, such as pastes or greases, will require either more pressure, a longer time setting or a larger size tip. It sounds like common sense and it usually is. But all materials have different properties! Thinner, less viscous liquids, such as Cyanoacrylates or thinners, will require less pressure, shorter time or a smaller tip size. 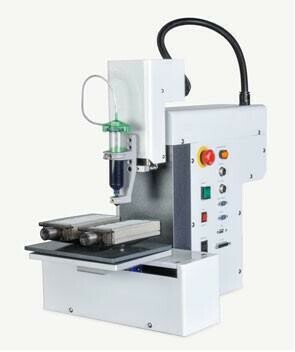 Higher pressure and/or short time cycle increases the dispensing speed and provides a higher output. *Please use these tables for approximation only. Tips and Caps are sold separately. For larger volumes, try our Cartridges and Plungers.